On every second day of the Lunar New Year, Ng Joo Soon will set up a buffet in his own independent house to entertain his family, including his sons, daughters-in-law, grandsons, granddaughters, his brothers, nephews, and nieces. He has a strong family concept and is very pleased with the joy of the New Year with his family. But in another part of him, there is a deep rift whose pain can hardly be healed. Ng Joo Soon used to be the executive chairman and president of Dovechem Group, the island city’s largest chemical company which brought an annual turnover of more than $500 million during its peak business period, with more than 30 subsidiaries throughout Singapore, Malaysia, Indonesia, China, Hong Kong, etc. But all this has become a history. In the morning of the eighth day of the Lunar New Year, Ng Joo Soon accepted Fortune Times’s interview in his office. He is over 80 years old but still looks as peaceful and kind as the early morning sunshine. But when looking back, he became restless. “I am an easy-going person and it’s sad to have such a family dispute,” he sighed, pointing out that there is no way back. 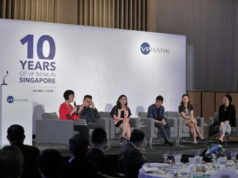 What bothers Ng Joo Soon is a typical dispute within a powerful family business. The business of Dovechem Group, which was founded by Ng Joo Soon, included chemical products and trade, iron barrels manufacturing, storage terminals, real estate, golf resorts, industrial parks, and high-tech products. The Group was successfully listed on the Singapore Exchange in 1996 during its peak period. But the Asian financial crisis in 1997 pushed it to the edge of the cliff. However, as the founder and soul of the group, Ng Joo Soon knew very well that the financial crisis was not the root of the problem as the group had a sufficient capacity to pay off its debts. He pointed out that the real reason behind the rapid decline of the group was that his brothers are eccentric and rivaling each other. More specifically, it is Andrew Ng Iet Pew, his most reliable nephew, who betrayed him most. Ng Joo Soon believes that this nephew had been grabbing power within the group since a long time ago, but his conspiracy was exposed by the financial storm. Ironically, it was Ng Joo Soon who fully subsidized Andrew Ng Iet Pew’s studying in Canada and Anta Ng Gek Nga, another nephew of Ng, studying in Australia. When the financial crisis came, the Dovechem Group owed a large bank loan in Singapore and Indonesia. At that time, rumors were everywhere – even from the bank executives told Ng Joo Soon privately not to repay the debts as long as he filed for bankruptcy and liquidation and could thus enter judicial management. However, since Ng Joo Soon always puts the business reputation first, he promised the bank that given some time, he would pay off the debt. At that time, the group’s asset fund was mainly in Indonesia. He first paid off the $70 million loans owed by the group to two banks in Indonesia and then asked Andrew Ng Iet Pew in Indonesia to remit the Indonesian company’s deposit back to Singapore to settle the group’s local bank loans. However, Andrew didn’t do as being told by his uncle. That made Ng Joo Soon begin to worry about the situation. Much due to the pressure, Ng Joo Soon started to have health problems. He recalled his eldest son, Ng Ik Hau, back to Singapore from the United States, to help him deal with the debt problem. Ng Joo Soon promised to repay the bank in Singapore. He sold an investment project at a low price and withdrew $6 million. Also, he sold the shares of the listed company one after another. Arranged by his son, he finally fully repaid the loan of $70 million, in the form of installments, until 2004, through Ernst & Young’s negotiations with the relevant lending banks. That saved the company’s brand and reputation. As a result of the deal, however, the Dovechem Group became delisted. During the negotiations, the banks asked all the shareholders of the group to provide private guarantees. So Ng Joo Soon had to find his two younger brothers, Ng Ju Aik (Ng Ju Goh) and Ng Ju Lak (Ng Joo Tian), together with Andrew Ng Iet Pew and Anta Ng Gek Nga. All of them were the group’s shareholders. As a result, the four men took the opportunity to ask Ng Joo Soon to reduce his share from the original 33.1% to 24%, and the remaining 76% were squared by the four, each holding 19%. In fact, the four’s shares were unconditionally donated by Ng Joo Soon. By the end of the negotiations in 2002, Andrew Ng Iet Pew’s shareholding had risen to 25%, making him the largest shareholder, while the other three’s fell to 17%. This change of shareholding, in other words, was to force Ng Joo Soon to step down. So Andrew Ng Iet Pew immediately took over as chairman and president of the group, revealing his ultimate intention and suppressing his uncle in various ways. Ng Joo Soon was relieved of his power and even became unable to repay the loan he had obtained from the bank for the company’s turnover. At that time, because Ng Joo Soon was too weak in the board of directors, he had no power to fight back. After being forced to step down, Ng Joo soon was very distressed. He knew his problem of using people improperly and was betrayed by his most reliable relatives. He did try to get back the group’s equity through a lawsuit and to recover the money that was loaned to the company. However, he was worried that if he didn’t have sufficient funding, he would suffer an even bigger loss in the case of a lawsuit. His second son, who was in charge of his real estate development in Shanghai, advised him to be patient. He told his father that when his real estate project was cashed out, they would he have enough money to go to court with them. The sons’ support and suggestions gave Ng Joo Soon more confidence to address the issue. Since Ng Iet Pew only cares for his personal interests and plans, he didn’t actually pay much attention to the company, leaving its accounts unaudited. After finding the evidence, Ng Joo Soon filed a lawsuit in a local high court on June 24, 2008, against Dovechem Holdings for its illegitimate dismissal of his position. Then, he sued the company and its four shareholders for violation of a contract that amortizes interest, installments and pays allowance, in hope of retrieving a sum of nearly $1.74 million. The four shareholders were his nephews and younger brothers. The two lawsuits were tried by the court and opened from March to April in 2010. After a series of intense trials, cross-examinations, and defenses, the court finally ruled that Ng Joo Soon won the case. However, since his nephew and younger brother were dissatisfied with the verdict, they found a new lawyer and appealed to the court. However, on July 19, 2011, the Court still upheld the original judgment. With that, this three-year lawsuit finally ended. The judgment of the case has now become a landmark among cases of shareholders’ rights. After winning the lawsuit, his nephew and younger brother agreed to convert his 24% stake into cash and subsidiaries, and the two sides separated. 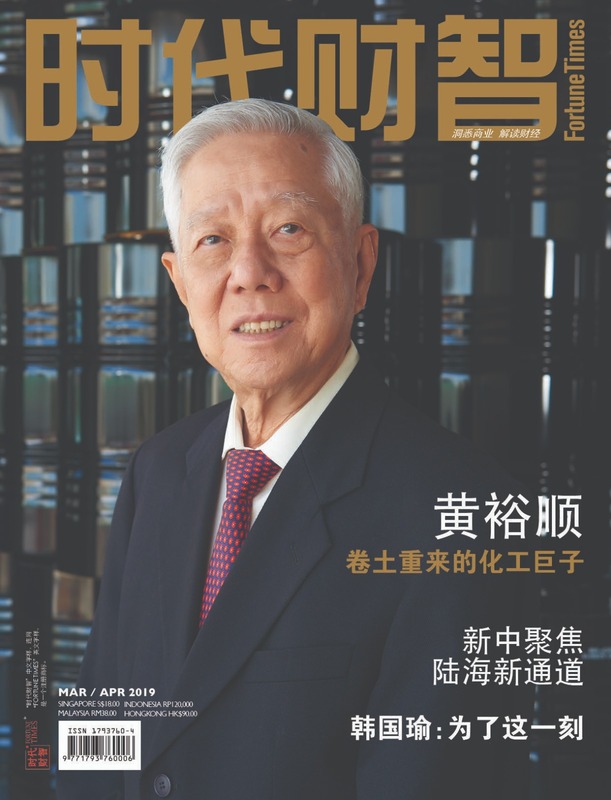 Ng Joo Soon took back the Indonesian chemical plant and dock, the golf course in Kunshan, China, and his first factory as well as his office in Singapore. More importantly, he also took back the trade names and reputation of the three companies, and since then, all the three trademarks have returned to his arms. This dramatic family conflict lawsuit is simply a new version of what happened in Chinese Wuxia fiction — the leader of the martial arts group relied mostly on his assistant who later became a traitor. In the end, although the conspiracy could not be won, the group was also greatly hurt. Throughout his road of entrepreneurial development — from start-up to listing, Ng Joo Soon has had more joy than tears. However, the family conflict was a big blow to him, making him feel helpless. After winning the lawsuit, he expected a comeback. The 81-year-old said that his determination and courage have witnessed the wind and rain, making his mind more stable and powerful than a young man’s. Ng Joo Soon has a big plan. First, he would maintain the brand reputation that he created. He believes that reputation is invaluable — something beyond the reach of his nephews and younger brothers. Therefore, he was hopeful that all his brands will win back their previous glory. He believed that this is the driving force for his comeback. Second, he believes in daring to make big decisions. In 2015, he once again invested 15 million US dollars to expand his first chemical storage terminal built in Indonesia and invested another 30 million US dollars to build two chemical plants, one for formaldehyde aqueous solution and one for paraformaldehyde. Both have been put into production. He also spent more than 30$ million on his first office and workshop of Tanjong Penjuru in Singapore, expanding its plant and building new machinery and equipment so that they could produce 200-liters iron barrels. In October 2018, the plant was put into operation which was hosted by S. Iswaran, Singapore’s former trade and industry minister. Ng Joo Soon was born in a poor mountain village in Malaysia in 1938. He had a strong endurance as a child. At the age of 19, shortly after he finished his studies, he went to a car dealership in Batu Pahat where he learned to repair a car. He worked until three or four in the morning each day and resumed working at 9 am. This kind of intensive work exceeded his affordability. Also, he felt that his abilities had not been fulfilled and thus resigned after only two months. Having a free ride offered by his friend, he returned to Singapore for further development. In Singapore, he was introduced by a friend and started to work at the Great Wall Paint Shop as a deliveryman. In the morning, he did cleaning work and polished shoes for his boss. At night, he slept outside the store. Although the company had trucks, he must ride a bicycle back and forth in order to save gasoline. A customer’s assistant, who knew the boss, complained about his living conditions and advised him to find a new job. However, Ng Joo Soon chose to stay since he was grateful that the company, anyway, offered him a job opportunity so that he might stay in Singapore. He only received a monthly salary of $40 and a meal allowance of $50. In order to save $30 a month, he lived an extremely frugal life. He worked hard and didn’t complain about anything, even facing unfair treatment. By this means, he won the trust of his boss who later gave him the opportunity to learn the techniques of managing the store. Two and a half years later, he felt that he had learned the necessary skills, and offered to resign even though the boss had to raise his salary to $200. Although his father hoped that he would return to work at Lee Rubber in Malaysia’s mountain village, he was most interested in the coating chemical industry. After returning home for a week with his family, he returned to Singapore and embarked on a journey of entrepreneurship. He saved $6000 in total all of which he invested in his start-up capital for his business in the painting business. He bought a bicycle to facilitate delivery. He also persuaded relatives living in Geylang to store the goods in their garage. Initially, he only had four clients and earned 300-400 dollars a month. 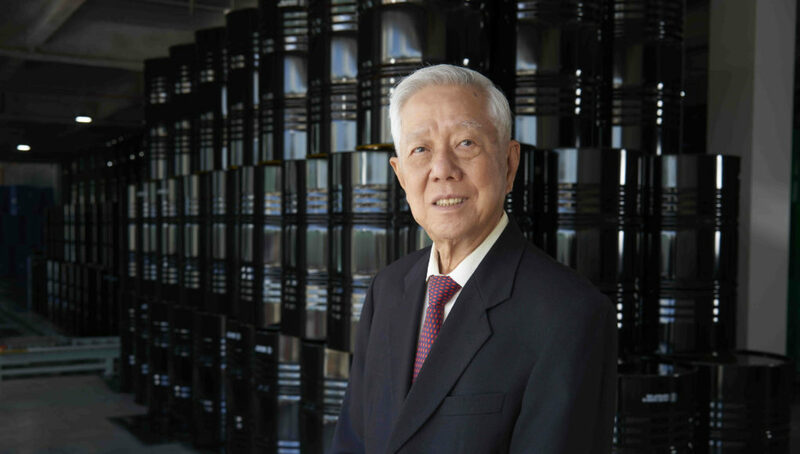 One of the clients was CK Tang who later developed a well-known shopping mall in Singapore. 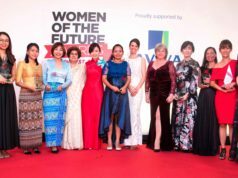 In just half a year, he earned enough to start a new company and immediately registered Thiam Joo Pte Ltd. He was 22 years old that year. Since then, he had used a pigeon as the company’s logo and had never changed it throughout his commercial expansion. Much owing to his honesty and faithfulness, he quickly made his business flourish. A year later, a brother and sister asked him to expand their sales by merging their businesses. Ng agreed and so set up a joint venture company. He invested $6,000, accounting for 60% of the shares while the brother and sister invested $4,000, accounting for 40%. In 1963, the second year of the company’s establishment, he rented a 1000-square-foot store in Bencoolen Street and began selling paint and chemical materials. 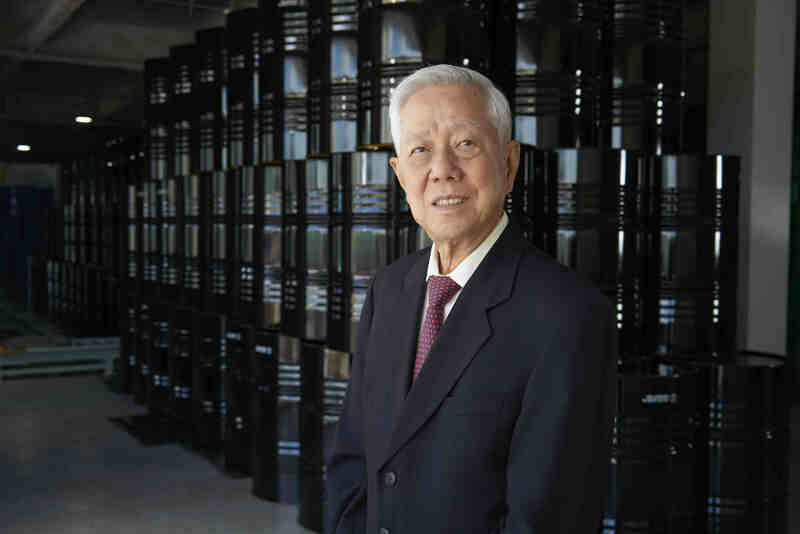 In 1964, he expanded his business to Malaysia and the company was becoming more and more profitable. He invested the profit of buying a townhouse for his parents. However, when the company’s business was booming, the sister and brother of the joint company asked to quit. After a year of discussion, he had to commit to investing $100,000 to buy their shares. Because of the insufficient cash flow, Ng Joo Soon had to borrow money from the usury to get through the financial crisis. However, in order to pay the 2% monthly interest, he had been working very hard so that he even had difficulty in dining and sleeping. Fortunately, he encountered quite a few decent people who not only introduced new customers to him but also offered him consolation to get through the crisis. In 1967, he finally brought his parents to Singapore, and held a wedding in Singapore, fulfilling his hope of forming a family. His wife was a teacher. During the interview, when asked “What is the biggest mistake in this lawsuit?”, she answered without thinking: “He likes to use his relatives!” She said so while looking at her husband. Her words were in a tone of blame but her eyes were filled with support and understanding. In order to meet the expectations of his parent, Ng Joo Soon takes good care of their brothers and sons. He gave 50% of the company’s shares to his younger brothers and a house to repay their loans. In the second year, when the company’s business went up, Ng Joo Soon sold the chemical raw materials to Indonesia for the first time. He made many friends in Indonesia who later became his business partners. At that time, Indonesia needed a large number of trucks. He worked with Indonesian Bandung Chinese Chen Guorong to buy trucks from Singapore and export them to Indonesia for sale. This business brought them considerable profits. The oil crisis of 1973 was a fatal blow to most people, but it brought him another rare opportunity. He bought hundreds of barrels of chemical raw materials from the UK before the crisis which had later pushed up the price of acetone (Acetone) by tenfold. He only sold ten barrels of acetone, which was enough to buy a Mercedes 280 luxury car. Although the crisis offered him huge profits, what he was looking for was the opportunity to open up the chemical business. He easily went to China to participate in the Autumn Fair in 1973 and first explored business opportunities in Hong Kong and the mainland. At that time, China’s Cultural Revolution was not over yet, and entering the mainland was not an easy task. He had to live in Hong Kong for a week before receiving a visa. The process of entering the mainland was also quite tortuous. In 1974, he and his Indonesian partners converted the profit from the sale of trucks into equity and established PT Thiam Joo in Indonesia to sell chemical raw materials. In just a few months, they saw a bright future for this business. He also opened up a two-way market, selling chemical products to China, and reselling China’s relatively low-cost chemical raw materials and solvents to Southeast Asia. The company’s chemical raw materials plant in Jurong began production in 1975. Unfortunately, two years later, the factory suffered a devastating fire which razed the factory, causing an economic loss of more than $4 million. As the factory only insured $3 million, it still had to bear a loss of more than $1 million. That made the company’s business fall into the bottom. However, he did not lose his faith. Instead, he saw a better business opportunity. In 1978, Sinopec Tianjin Purchasing Department ordered 5,000 tons of chemical raw materials from him. When the oil crisis broke out again the following year, chemical raw materials rose sharply. Tianjin was worried that he would be tempted by price and resold the products to other customers. However, he insisted on business integrity and still sent the products to Tianjin by the original price. That won him a good reputation from the customers. Two iron barrel manufacturers around the world monopolized the market then. One was Rheem and the other was VanLeer. Customers didn’t have other choices. The strong-minded Ng Joo Soon created the idea of making iron barrels. He knew that this business was not easy, but he was willing to overcome all odds and to face off with the two rivals. He spent three million dollars on the necessary equipment and made it into production. However, he only found that the information given by the machinery company was not correct, and the iron barrels leaked out. The unwillingness to accept the loss prompted him to go to the United States to buy second-hand barrel machines. After six months of testing, he finally produced iron barrels that did not leak oil. Soon after that, VanLeer’s Dutch president visited Ng and made several suggestions to induce him to give up the plan to produce iron barrels. But Ng was not persuaded. In the end, the presidents even were willing to bid $10 million to acquire Ng Joo Soon’s iron barrel machine and factory, which was still rejected. After that, the two companies joined forces to pressure him to find customers. He felt that his self-esteem could not be trampled on, and he began to think about the strategy of letting the barrel factory survive. Ng Joo Soon finally decided to maintain this business by improving quality, building image and saving costs. Where there is a will, there is a way. Soon, Ng got orders from several oil companies, including Shell, Exxon, Mobil, etc., from Chinese customers to multinational companies, from Singapore to the region. 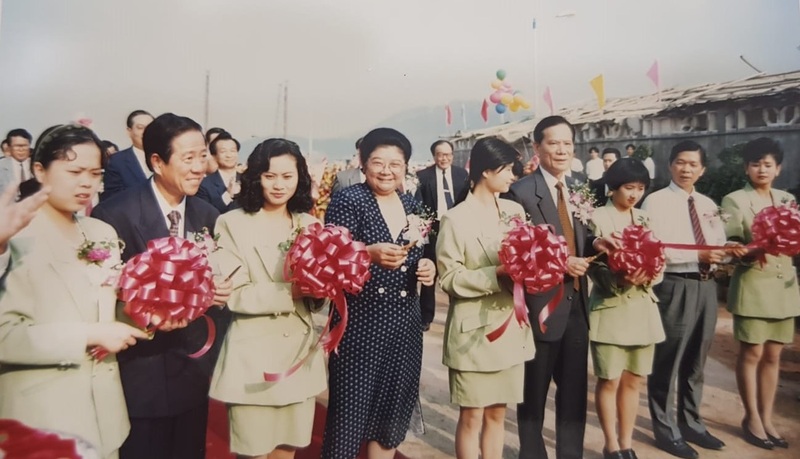 Ng Joo Soon (second from left) attended the opening ceremony of a company in Shenzhen under Dovechem Group in 1992. Although Ng went to Indonesia to develop business in 1968, he only sold a few hundred barrels of chemical raw materials. In 1982, he went to Indonesia, planning to build a liquid storage dock. He finally selected Merak, not far from Jakarta. He was originally prepared to build a melamine formaldehyde (Formalin Melamine) plant before building a liquid storage dock. He did not expect both plans to take shape and obtained a business license four months later. In 1987, he saw that many of the three plywood factories in Kuantan needed Formalin glue, where they built a liquid storage dock. What he valued at the time was the future of Kuantan. He made a good decision then and it had become a chemical production base and logistics center in Malaysia. In the same year, Ng went to China to find a place to build a bulk storage terminal. At that time, he suggested to Nanyou of Shenzhen to work together to build a liquid storage dock. Unfortunately, the general manager of Shenzhen Nanyou soon changed. The new general manager Guo Ruitang did not pay much attention to his idea at first. After learning that Ng was a very trustworthy businessman, he decided to implement a cooperation plan with him to build a bulk storage terminal in Shekou, Shenzhen. This was also the first bulk storage terminal in China. What makes Ng even more admirable to Nanyou is that even if the Tiananmen incident occurred in China in June 1989, when foreign investors dismissed their investment plans, Ng Joo Soon did not waver, and insisted on his commitment to invest 2 million US dollars into Nanyou. His highly trustworthy style had once again won the appreciation of the business community. With the success of Shenzhen, he went to Pudong, Shanghai in 1993 to find the opportunity to build a second bulk liquid storage dock. The project would open in three years. Another plan was to go to Qingdao to build his third liquid storage dock in China, which was implemented in 1994-1995. So far, he has three liquid storage docks in China. It was a pity that after his financial crisis in 1997, his group had successively sold these important commercial bases one by one. Five years ago, Ng Joo Soon, who was 76 then, decided to write his life’s ups and downs as memoirs, so that his children and grandchildren could learn from them. He named the book “The Road I Walked.” The book’s first part is “hard work”, which introduces his experience till the financial crisis in 1997; the second part is “the comeback”, which talks about the family conflict and lawsuits he experienced after 1997. Already at the age of 81, he is still as fast as a swallow, and his voice as clear as a bell. He was very proud of his three sons who are hardworking and very successful in their career respectively. His second son is planning to launch a new paint service model, the US color code, to solve the color matching problem for customers. This is also an innovative product of the group, which allows the company to take its advantage in the market. Ng Joo Soon was born in a poor family in a hilly village in Malaysia in 1938. He ranks seventh among 10 brothers and sisters. When he was four years old, he experienced the hard years of the Japanese occupation of Malaysia. After three-and-half-year during the Japanese occupation, the turmoil of the armed conflict between the Communist Party of Malaysia and the Central Government was ushered in. The entire village was ordered to move to Lee Rubber, and Ng Joo Soon himself became a rubber boy. In the wee hours of each morning, he got up and started to work. In the afternoon, he went to school till night. In 1957 when he was 19 years old, Ng Joo Soon had finished his studies and went to work in a car dealership. In 1960, Ng Joo Soon founded Thiam Joo with a capital of S$ 6,000 when he was only 22 years old. At the peak of his career, he had a turnover of $500 million a year. And he used to be the industry leader of more than 30 companies. His business expanded from Singapore to Malaysia, Indonesia and China. He was the first foreign investor in China to invest in chemical storage docks and achieved victory in Shenzhen, Shanghai, Qingdao, and Tianjin. In 2015, he invested 15 million US dollars to expand Indonesia’s first chemical storage terminal and invested 30 million US dollars to build two chemical factories. 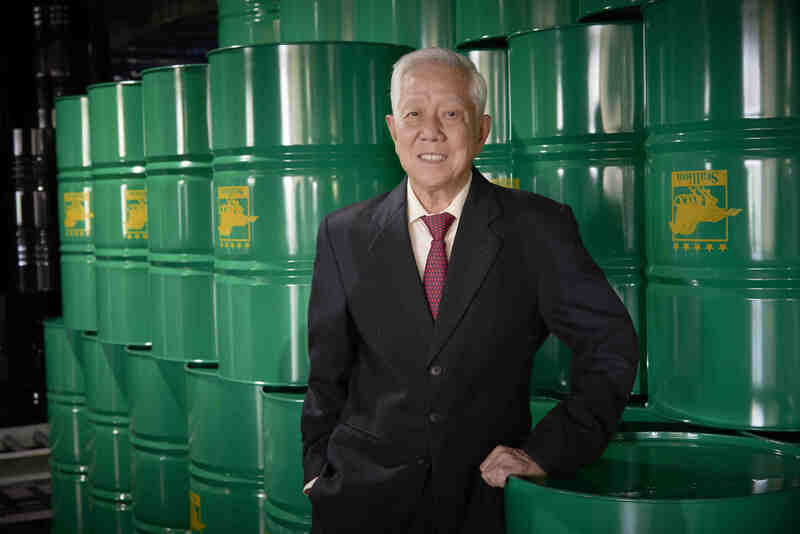 In 2018, he invested more than $30 million in Singapore to expand the factory and add new machinery to manufacture chemical barrels. When he was 80 years old, he started to painstakingly write his autobiography. The logo of the Dovechem Group is a pigeon with leaves, meaning the harmony with its peers. After each storm, the pigeon can always fly farther in the sky. Fortune Times wishes all a Happy Prosperous Lunar New Year!